I previously mentioned Noah being ill, and now I've been struck down (exaggeration) with this flu type evilness, so the idea of a weekend project was lost in the (very blustery) wind. But it's holiday time! So I've decided to knit a hat that will take longer than a couple of days. ... which I have always put off because I hate knitting purl and I hate seams on hats. But this evening I found this photograph of the same hat. Well, what do you know?! 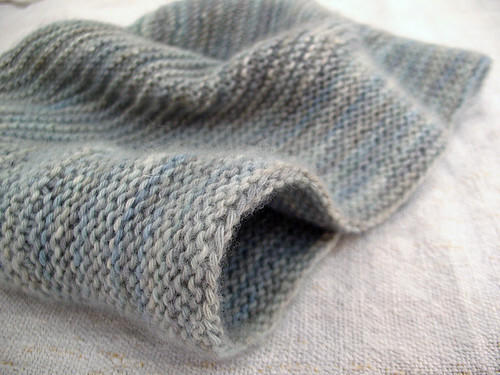 As explained in the blog post, knitting garter stitch in the round produces this jog in the fabric, which looks like a seam! No. ... which is beautifully demonstrated here. The original pattern for this hat is in DK weight. I'll be using this yarn which was a gift from my brother and his wife some time ago - yet another treasure unearthed by the recent organisation. Here's another nice photo of the same design by CocoKnits. Off to do more research, now... or bed? Difficult decision!